May 25: Recurrent Energy has made arrangements to initiate a “demonstration project” just south of the proposed Yakima project. 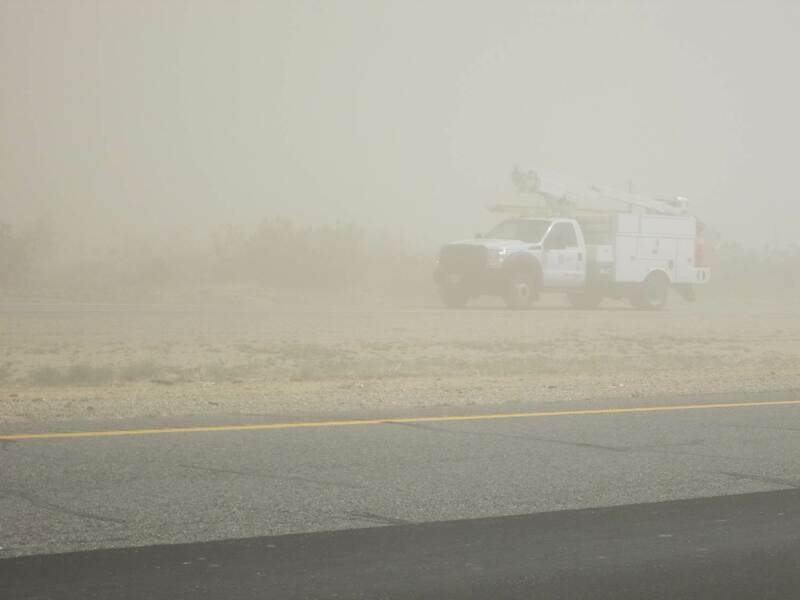 The announcement came at the Mojave Chamber of Commerce meeting on May 22, despite assurances from Kern County that the project was in “deep freeze”. 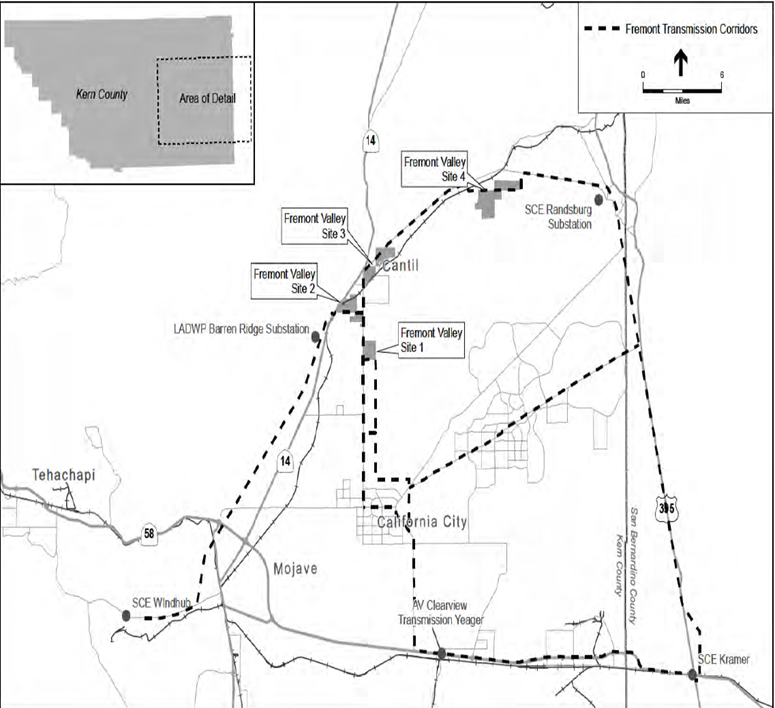 According to Recurrent’s Seth Israel the demonstration project will be much smaller than the Yakima project, only 22 acres, and located at Purdy and Holt in southwest Mojave. 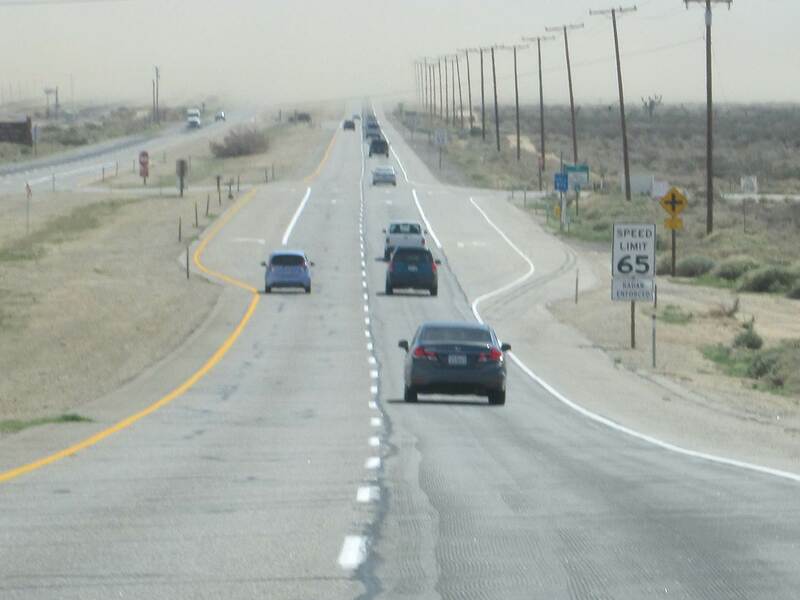 The demonstration project will only mow the vegetation instead of grade it, and will include fencing around the area to block the wind and reduce fugitive dust. The project will also be monitored by a contractor hired by Recurrent to measure air quality and particulate matter at a time of year with mild wind. The results of this data will be used in future months to persuade the Board of Supervisors to issue the zoning changes and conditional use permit that will allow Recurrent to break ground on its much larger 262 acre Yakima solar project. The Mojave Foundation is an avid supporter of Solar Energy but we are opposed to the location of the Yakima solar project, which poses a health and safety risk to our residents. 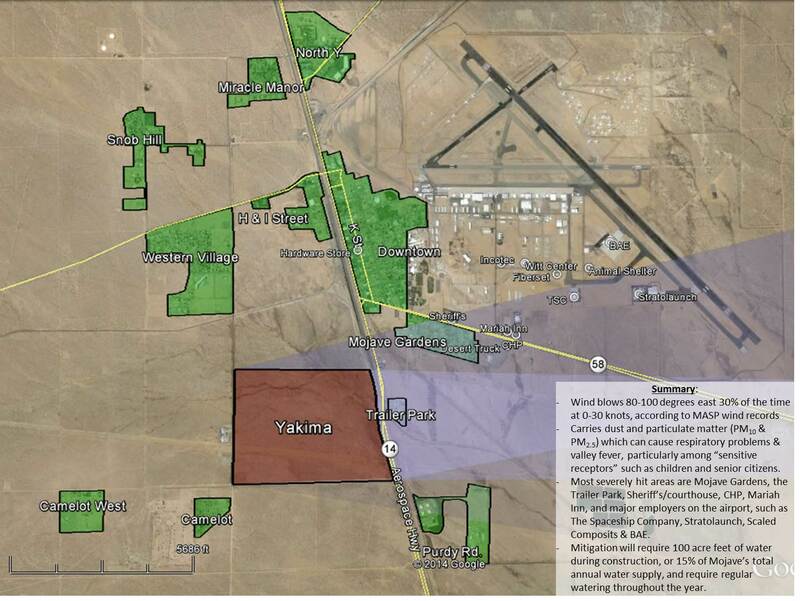 The proposed Yakima project is only 1,400 feet upwind of a densely populated area (Mojave Gardens), as well as a trailer park, the Sheriff’s Office, CHP, Hotels, and millions of dollars of investment on the Mojave Air & Space Port. We also reject the scientific method which is being used, since the measurements will be taken at a time of year that is far less-windy than the time when construction would begin on Yakima, and we do not consider the experiment to be objective since it was designed and conducted by Recurrent’s own contractor, Environ. 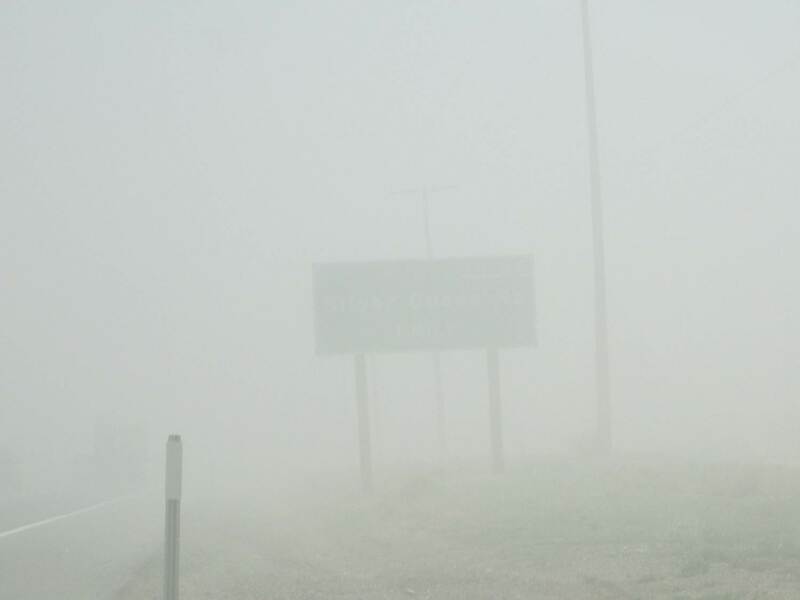 This project poses too grave a health risk to the children and elderly directly downwind, as evidenced these pictures taken throughout the month of April of Recurrent’s Columbia-I and II projects, despite the acre foot of water spent daily (2 million gallons per week) to control dust. We urge residents and interested parties to write letters to the Kern County Planning Department to voice their concerns at georgej@co.kern.ca.us or 2700 M Street, Suite 100, Bakersfield, CA 93301-2323. This entry was posted in Kern County Planning, Mojave CA, Recurrent Energy, solar, Yakima on June 1, 2014 by mojavefoundation. February 8: The Kern County Planning Department is revising its previous recommendation to approve the Aquahelio Fremont Valley water/solar project that would extract 114,000 acre feet of water per year (37 billion gallons per year) within 8 years. The Planning Commission approved the Aquahelio project by a vote of 3:2 on January 23rd amid much concerns from local water departments and communities. The planning department is now recommending that the Board of Supervisors refer the project “back to staff to revise and recirculate the Environmental Impact Report (EIR)”, according to a Feb 7 memo issued by the Planning Department. Although this does not permanently kill the project, it does raise questions about whether Aquahelio will continue to pursue an application process that has taken years. Click here for the memo from the Planning Department. 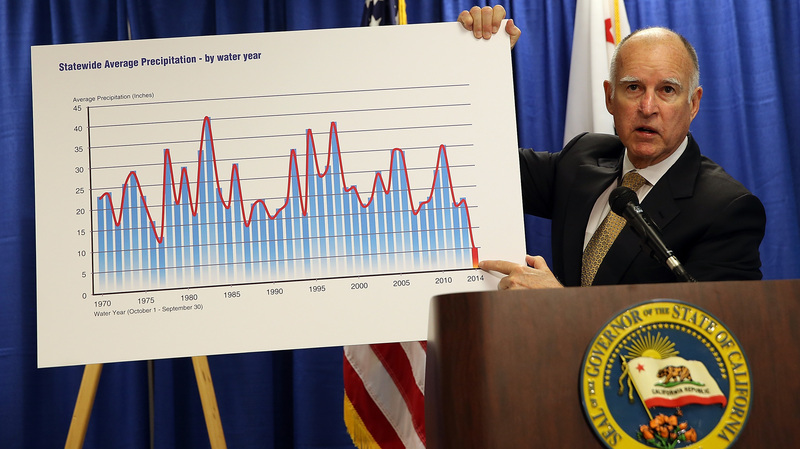 The decision by the Planning Department comes amid a “water emergency” issued by Governor Brown, and recent revelations that the Los Angeles Department of Water and Power (LADWP) is likely the reduce this year’s allocation of water to zero. Since a cornerstone of the Aquahelio project relied on “water banking” (temporarily storing some water from the LADWP Aqueduct in the Fremont Valley aquifer) to recharge the ground water extracted by Aquahelio, the Governor’s decision to restrict water allocations “calls into question the sufficiency of the project”, said Planning Director Lorelei Oviatt in an interview with the Bakersfield Californian. Since water banking typically requires depositors leave 10 percent of the water they store in the bank, the Planning Department took that 10 percent into account when reviewing Aquahelio’s EIR, Oviatt explained. Click here for the full article. Locals estimate the Fremont Valley Aquifer’s natural “recharge rate” is historically 15,000 acre feet per year, but nobody knows what the aquifer’s actual rate of recharge or depletion has been since the drought which has lasted in east Kern County for over four years. The Board of Supervisors will hear the case and the Planning Department’s recommendation on February 25th at their normal meeting place at 1115 Truxton Ave in Bakersfield. This entry was posted in Aquahelio, Kern County Board of Supervisors, Kern County Planning, Mojave CA, renewable energy, solar, water on February 8, 2014 by mojavefoundation. 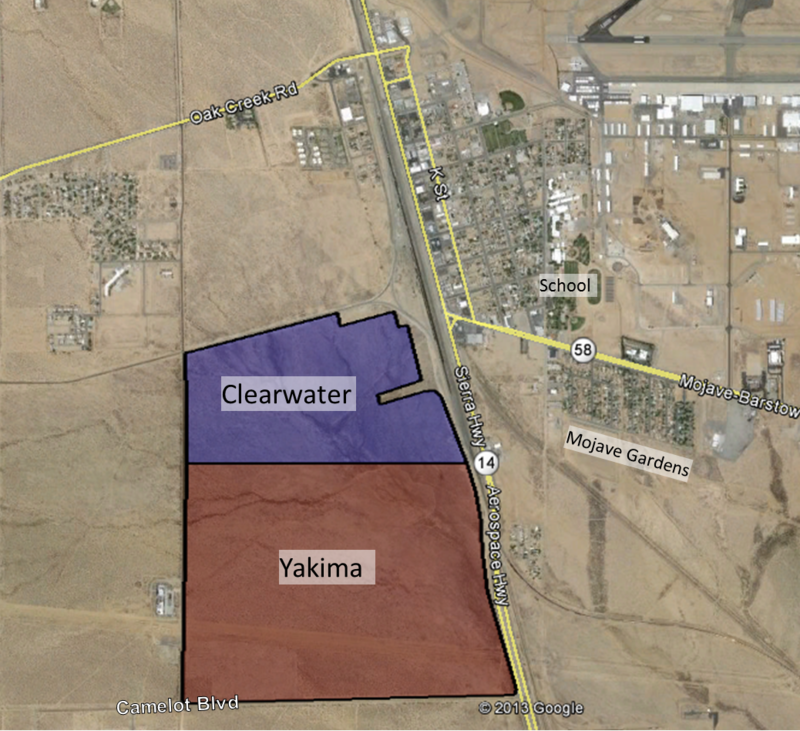 23 January: By a 4:1 vote the Kern County Planning Commission approved the Clearwater/Yakima solar project by Recurrent Energy of San Francisco. 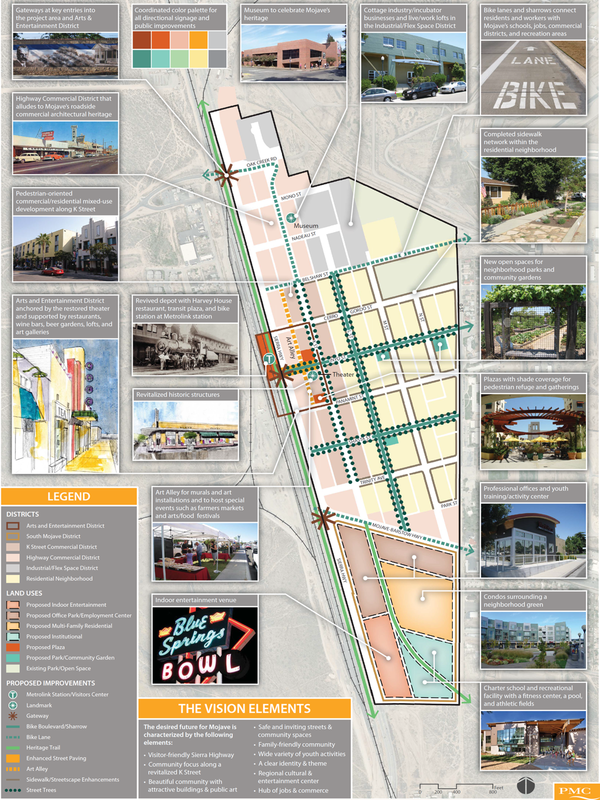 At 1 square mile, the project would be larger than Mojave’s downtown area, located west of Sierra highway and north of Camelot Boulevard. Proponents advocate that the project would produce 40 megawatts of clean renewable energy and create up to 200 temporary jobs. 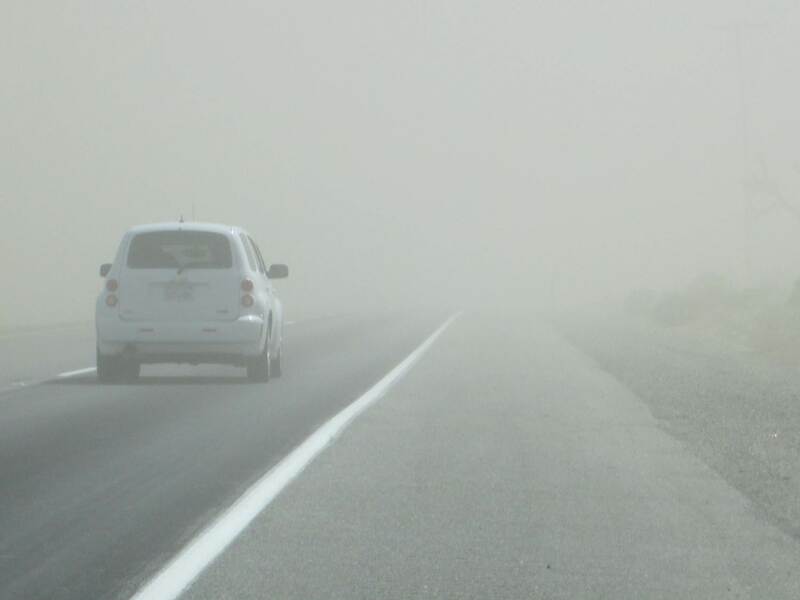 Critics claim the project, located just 1,400 feet west of a residential area and school, would release dust and other pollutants, kicked up by Mojave’s strong winds, causing health problems for children and elderly residents. Many residents support renewable energy, but resent the location. 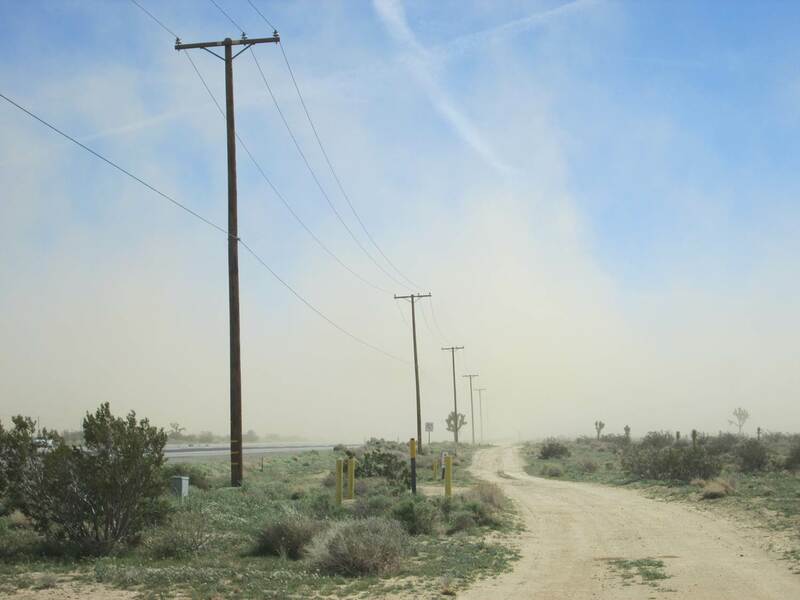 But Recurrent Energy claims this is the only parcel in Mojave with a single owner willing to sell the property, and it is located close to a power sub-stations installed by the wind companies. Kern County provided a video conference in the Mojave Veteran’s Hall for residents to participate in the hearing, but most citizens left after midnight. The hearing, which lasted over seven hours, involved 13 other items, but the agenda was changed twice so that the Recurrent project was heard last. Opening comments began at 1:30 am, and the final vote was not reached until 2:30 am, by which time most residents in Bakersfield and Mojave had gone home. Click here to watch the hearing online. Commissioners also approved the Fremont Valley water & solar project by Aquahelio of Beverly Hills, by a vote of 3:2. The Aquahelio project plans to take 114,000 acre feet (AF) of water (37 billion gal) per year from the Fremont Valley aquifer located north of Cal City. The Fremont valley aquifer contains about 1 million AF of known safe water, and possibly up to 7 million AF of unexplored water at deeper levels. Historically the aquifer has a natural recharge rate of approximately 15,000 AF per year. Proponents argue that the project is necessary for Kern County’s long term water security. Critics argue that the project will gradually deplete a precious natural resource, sending water to other areas of Kern County and could be used for “fracking” or other industrial uses. Critics also argue that the project is an attempt to control a majority of East Kern’s water resources, making the entire county reliant on one company if drought conditions persist. Aquahelio offered a last-minute compromise to the commission, offering to stagger the water extraction to 5,000 AF in the first year, 10,000 in year two, 20,000 AF in year three, 50,000 in year four, 80,000 in year five, and 114,000 by year eight to continue indefinitely. The compromise also selects a joint Kern/Aquahelio commission to oversee the project to ensure that the company does not destroy ground water or private wells as extraction rates ramp up. Opening comments began at 11:30 pm, and public comments continued well after midnight. Commissioners appeared divided as they began deliberations around 1:00 am with three out of five initially intending to vote “no” on the water portion of the project. However, when Aquahelio asked the commission to vote on the entire water and solar project in its entirety, one commissioner switched to a “yes” vote, delivering an approval for the project. Both projects are now referred to the Board of Supervisors who will make the ultimate determination whether these projects will go forward. Click here to watch the hearing online. The Mojave Foundation is primarily concerned for the health and safety of our residents, and our long-term water security. Although we support renewable energy, and solar in particular, we must not disturb our ancient desert ecosystem before we have a credible plan in place to minimize the health impacts to our residents. We also call on Kern County to ensure that the Fremont Valley has a sustainable source of water for generations by providing intense scrutiny and oversight of all consumers to ensure that water extraction does not exceed our natural recharge rate. This entry was posted in Aquahelio, Beautification, Community events, Kern County, Kern County Planning, Mojave CA, Recurrent Energy on January 25, 2014 by mojavefoundation.